The visual took time to get accustomed too but it's not that big deal. 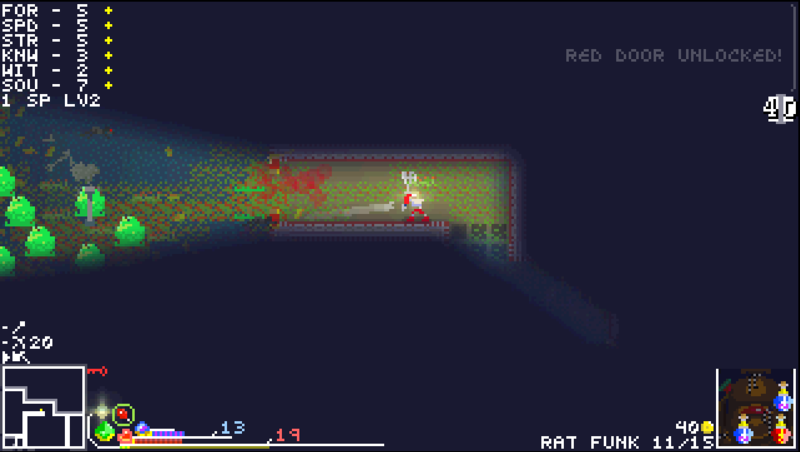 However, when stuffs overlap, it's hard to know what's going on for e.g there's a room with lots of slime, golds, furniture, projectile shooting monster and spikes. Spike couldn't be noticed unless i take a close look at the hp bar. Receiving damage "juice" should be improved too. The light doesn't turn as fast in the corner so if there's enemy waiting it would be disastrous. It's pretty fun if you know what's going on. Personal preference: i feel slime shouldn't bleed. Shouldn't they explode in gooey form? It's fun. 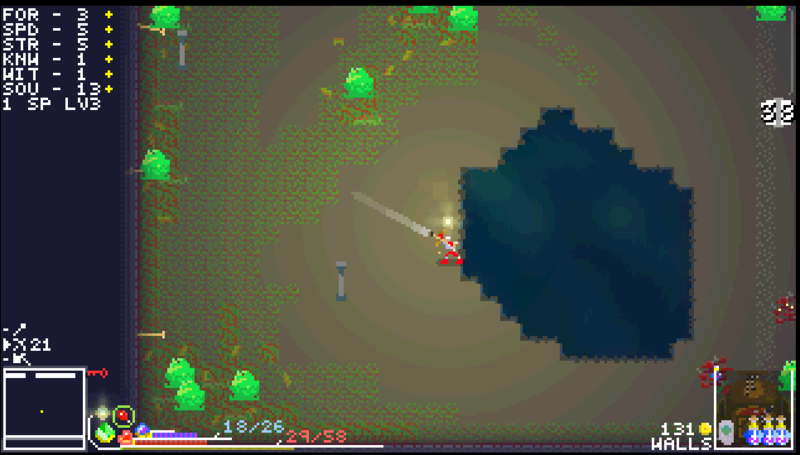 The graphics are sometimes a little unclear because of the low resolution and sprite design (sorry, I know you've heard this kind of thing a million times), but I think they mostly work pretty well in motion. I like the effect on the water especially. Like Fervir, I too missed that first door for a while and got a little stuck because of it. 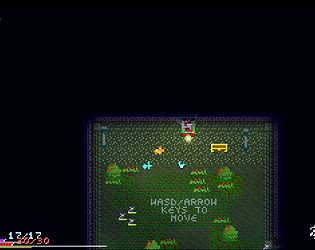 The downstairs areas look a bit better in terms of colors, stuff is more readable and less noisy. How items physically exist in the inventory is an interesting feature. Having to click on items to pick them up is sometimes a little finicky though, and they can sometimes be hard to make out. The different weapons/magics were fun to use and were each useful in their own way, and the sounds for everything are nice so far. In general it's fun, good stuff so far. This game is really fun, I'm writing this after just figuring out that there was a door in the first section. It takes a while to get into and it's slightly overwhelming at first, but it's pretty fun trying to figure out what everything does. I got lost at first cause I had no idea that there were doors. In that beginning screen I was wondering what the point of that single enemy was. Also, when you die, it seems like everything resets except your stats, your health and probably gold. The graphics are pretty sweet, but it's hard to tell what things are at first cause everything is so low res and the fact that you can't pick up some stuff, like magic restoratives until you use magic, makes things a little more confusing. I was trying to right click on the magic restorative stuff and got more confused when nothing happened. Pretty good enemy variety so far. Seems like a really fun game, I'm looking forward to exploring more stuff.